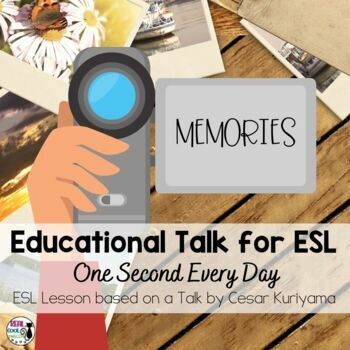 ESL Lesson: Based on a TED talk by Cesar Kuriyama and designed for upper intermediate to advanced ESL learners to practice listening, speaking, reading, writing, vocabulary and grammar skills. Discussion questions encourage higher order thinking. 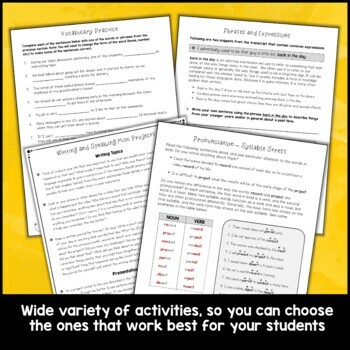 ✤ Vocabulary activities: matching and cloze activities with vocabulary from the Talk to prepare students for the video. 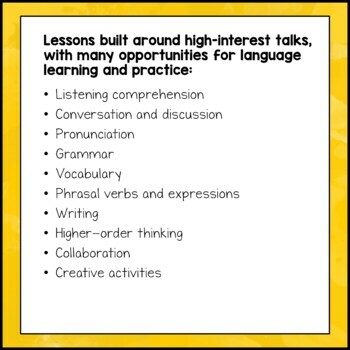 ✤ Phrases and expressions: two expressions from the talk are highlighted; explanation and examples are given with a change for students to practice making their own sentences. ✤ Mini grammar lesson and practice activity for future time clauses. (e.g. I will call you when I get home: many students want to put the word "will" in the time clause) I have found that even the most advanced students have trouble with these, so this is a good introduction or review for this concept. ✤ Two pronunciation activities relating to the difference in pronunciation between two-syllable words when they are used as nouns/adjectives or verbs (e.g. record, project, desert) and multisyllabic words ending in -ate (chocolate, separate, certificate). ✤ A list of writing and presentation mini project activities related to the Talk topic. An editable version of this document is included also. 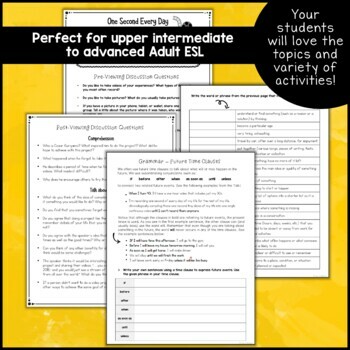 ✤ Download includes 8 lesson pages plus notes and answer keys.